As you've probably heard, a Reddit user recently threatened to take legal action against Warner Bros. for their supposed “false advertising” surrounding Suicide Squad. This news got us thinking about other times fans have sued popular movies. After doing a bit of research, we were surprised to learn it happens a lot more than you might expect. After all, a lot of movies are released every year. Some of them are bound to ruffle some feathers. And if the owners of those ruffled feathers have access to legal counsel, or, more honestly, if they have access to an internet connection, there’s a good chance they’re going to make their gripes publicly known. We’ve rounded up 15 of the most insane lawsuits (or threatened lawsuits) regarding popular movies. Some of these lawsuits actually make some decent points, some are more about the individual being personally offended, and some are just flat out absurd. We’ll let you decide for yourselves which are which. Beginning with the Joker himself, here are 15 Insane Reasons Fans Sued Movies. As previously reported, there was a surprising lack of Jared Leto’s Joker in David Ayers’ Suicide Squad. The infamous clown prince was featured prominently in all of the trailers, posters, and marketing for Suicide Squad, with tales of Leto’s on-set pranks dominating much of the film’s promotional circuit. Upon the movie’s release, however, fans were surprised to see how little of Leto’s Joker appeared in the finished film. A Reddit user in the UK was so disappointed that he has threatened to take Warner Bros. to court for their supposed “false advertising”. The fan, whose username is BlackPanther2016, claimed in a post that he had driven over 300 miles (why a user in the UK measures his travel in miles, not kilometers, could be seen as a little odd) to see several specific scenes promised in the trailers and, after not seeing those scenes, was laughed at by theater employees for demanding his money back. The possibility remains (as with many entries on this list) that BlackPanther2016 is pulling a stunt to garner attention, or just attempting to troll the internet for a few days. However, it’s always possible this user has discussed his case with legal counsel and is planning a thought-out, professional lawsuit. Only time will tell. Until then, maybe Leto’s troubling half-apologies will console him. On paper, Nicolas WInding Refn’s Drive sounds like it could be a very straightforward action film, in the vein of The Transporter series or a Fast and Furious film. It stars two attractive movie stars, it focuses on a criminal getaway driver, and it features several robbery and car chase sequences. For at least one woman, this was what she expected when she bought her ticket. Imagine her dismay, then, as she watched Refn’s bleak, hypnotic, and brooding Los Angeles fairy tale noir splash across the screen in bleary neon light. For this woman, Drive was neither Fast nor Furious enough for her liking. This woman was Sarah Deming of Michigan, and she was so appalled at the lack of action in the film, she filed a lawsuit against Filmdistrict, who distributed Drive. Deming claimed the trailer misled her into thinking she would see a Fast and Furious-type film, not the hyper-violent, experimental feature Refn concocted. Deming also claimed the film promoted violence against members of the Jewish faith, which seems a bit of a stretch. The theater she saw it in happily offered to refund her ticket, which is surprisingly the only demand of the lawsuit. In the same lawsuit, the mayor claimed that Hollywood executives had made it impossible for his city to set up businesses abroad. Even more befuddling is the fact that the lawsuit blamed Warner Bros. for several unsolved murder cases in their town, as well as a high female suicide rate in their city. The mayor cites the psychological impact of the films as the cause of these tragedies. To fortify their case, the city intended to prove its name predated the creation of Bill Finger and Bob Kane’s famous superhero. We’re willing to bet that yes, it probably does. But that doesn’t explain why the city is specifically suing Nolan and Warner Brothers, when people have been profiting off the name "Batman" since 1939. Of the many criticisms leveled at the forgettable 2009 Nicolas Cage vehicle Knowing, being too “realistic” was not a very common one. But that’s exactly the problem tech startup Global Findability had when they saw the film. They slammed the film with a patent infringement lawsuit, claiming the movie stole their idea for disaster-locating technology. In 1995, a young man named Ben Darras and a woman named Sarah Edmondson robbed a convenience store and shot a shop assistant named Patsy Byers. Sadly, Byers later passed away from her injuries. Darras and Edmondson, who are now serving a long-term prison sentence, claimed they had watched Oliver Stone’s Natural Born Killers several times in the days leading up to the robbery, and that the violent acts displayed in the movie had inspired them. On these grounds, the family of the shop assistant sued the film, claiming it had incited the violence that rocked their family. The long-running lawsuit was finally thrown out in 2001, when Judge Robert Morrison finally ruled that the filmmakers were practicing their right to free speech, and never intended to encourage violence or illegal activities. The case is a sad and troubling one, and it definitely raises some interesting questions regarding free speech and filmmaking choices. While seeing the 2005 film Monster-in-Law, a woman was upset to find out that Jennifer Lopez’s experience in the film was eerily close to her own experience. While we would venture to guess a lot of people have had rough experiences with their parents-in-law, this particular woman, named Sheri Gilbert, believed the movie was directly stealing from her. She had apparently written a screenplay about her own tense relationship with her mother-in-law in 1998, and she said the similarities were uncanny. She sued Jennifer Lopez, Jane Fonda, and others involved in the making of the movie for stealing her idea. When hit with the lawsuit, attorneys at Warner Bros. responded with a shrug. The lawyers made the very valid observation that an annoying mother-in-law character was by no means a groundbreaking and unheard of concept in film. Sheri Gilbert disagrees. She holds fast in her argument, claiming the similarities between her script and the 2005 film are too conspicuous to be ignored. An author named Isabella Tanikumi sued Disney’s Frozen for $250 million for supposedly stealing the movie from her autobiography. Bear in mind that the film was based on a Hans Christian Andersen fable called The Snow Queen, written in 1844. That knowledge didn’t stop Tanikumi from suing, citing 18 similarities between her life story and the animated film. Some of these similarities include the fact that both stories took place on snowy mountains, they’re about sisters, and both sets of sisters experience trauma. We’re not experts, but this case sounds flimsier than a snowman on a hot summer day. No one comes out of Wolf of Wall Street looking good. Martin Scorsese’s 2013 film focuses on some of the most selfish, despicable characters we’ve ever seen on film. They knowingly take advantage of others, they’re addicted to drugs, and they have offensive and tasteless parties in their offices on Wall Street. While there has been much debate about whether the movie itself condemns or condones these heinous acts, for most audiences, it’s pretty clear that these are not good guys. One of those aforementioned guys was surprisingly unhappy with being portrayed as a greedy, womanizing villain. In the film, the character of Nicky “Rugrat” Koskoff was apparently based on real life investment banker Andrew Greene. Greene, who was portrayed in the film by actor P.J. Byrne, has sued Martin Scorsese, Leonardo DiCaprio, and others associated with the movie for the insulting use of his likeness. Greene says the filmmakers never got his permission to use his likeness, and that the defamatory nature of the film is now hurting his business. Greene also specifically mentions the hurtful nature of all the toupee jokes that were made in the film at his character’s expense. Borat made quite a stir when it was released in 2006. Prior to the film’s release, the movie was flooded with lawsuits. Seemingly everyone involved in Sacha Baron Cohen’s faux documentary was, understandably, unhappy with their appearance in the controversial comedy. We’ll run through just a few of the lawsuits. The tiny Romanian town of Glod, which was used as the backdrop for Borat’s hometown, sued the production for the unflattering portrayal of their lifestyle. Citizens of the town claimed they had been led into believing they were appearing in a documentary, not the satire it turned out to be. The frat brothers who travel with Borat at one point and make racist and sexist remarks sued the production for the defamatory way they came off in the movie. They claim the producers intentionally got them drunk and led them to believe the documentary would not be released in the U.S. This case was thrown out. The women who run the etiquette school shown in the film also sued, saying their business has been ruined by the release of the film. This case was also dismissed. While we can’t be sure, we’re willing to bet the producers wouldn’t risk their film by intentionally lying and misleading people. We think this sounds more like a confusion of documentary and fiction. We would think that the producers of a a film titled Mr. Holmes, which centers on an aged Sherlock Holmes, would be certain they'd acquired all the rights needed to produce a Sherlock Holmes movie. This is apparently not the case, however. Upon its release, the Ian McKellen-starring film was hit with a lawsuit from the estate of Arthur Conan Doyle, who claimed the film infringed on several stories that are still protected under copyright laws. While many of Doyle's Holmes stories now exist in the public domain, several are still protected by copyright law. Of these, a few focus on an older Sherlock Holmes, and his life as a retired detective. As you can see, the Doyle estate was probably justified in raising their concerns. An undisclosed settlement has since been reached. We can only hope that, at some point in the process, the lawyers referred to the case as “elementary”. Several years ago, Apple sued Samsung for copying its design of the iPad with their Samsung Galaxy Tablet. Rather than conceding defeat, however, Samsung presented a surprising argument. They couldn’t be sued for stealing the iPad, because the iPad itself was stolen from someone else. Who, you may ask? Stanley Kubrick. In court, Samsung presented their defense using a still image from Stanley Kubrick’s 2001: A Space Odyssey. In the still clip from the film, the two astronauts are seen eating and using tablet computers that look remarkably similar to the iPads that Apple would develop almost thirty years later. Samsung claimed they couldn’t have stolen an idea from Apple if Apple stole it from somewhere else. Of course, tablet computers were seen in plenty of sci-fi movies after 2001, including Star Trek and even The Incredibles. The judge ruled out the film as proof, but did allow Samsung to use the Fidler and Compaq tablets, which were invented before the iPad, but not used in any Arthur C. Clarke movies that we know of. Avatar, while being a magnificent technological achievement, is not the most wildly original story. James Cameron’s script plays on many familiar, often used tropes. Many people have pointed out the similarities it bears to Disney’s Pocahontas, as well as Dances with Wolves. And so, when the movie proceeded to rake in billions of dollars in box office, a lot of writers came out of the woodwork complaining the story was stolen from them. The lawsuits are too numerous to detail fully here, but they range from suspicious to laughable. One writer claimed Cameron had stolen the idea from a book that he had written, despite the fact that his book came out after Cameron started developing the film. Another screenplay writer claims he pitched a very similar idea to Fox years earlier and was rejected. He sued Cameron for $2.5 billion dollars in damages. As we said, these strike us more as parallel thought than outright theft. The story features so many familiar beats and tropes that some crossover between this and other projects was inevitable. In July 2015, a Chinese animated feature titled Autobots was released in that country. Upon watching the children’s film, many viewers noticed the striking visual similarities between Autobots and the Pixar film, Cars. Even the poster featured a red, anthropomorphic car who bore more than a passing resemblance to Lightning McQueen. 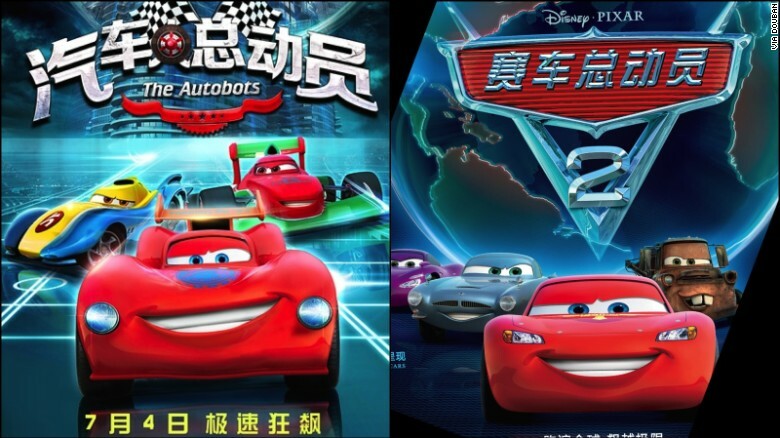 The similarities were not lost on Disney, who sued the Chinese film production company who released Autobots. Though one would think they have a pretty solid case (seriously, the two posters are virtually indistinguishable from each other) many people are predicting the lawsuit won’t go very far. China has a long history of producing bootleg versions of popular cartoons. Our personal favorite is the Chinese hit cartoon Bear of the Interest, which shares some striking similarities with Winnie the Pooh. More troubling are some of the bootleg games produced in China that have been inspired by Disney films, with the most disturbing probably being the Frozen-inspired “Anna Cesarian Birth” online game. Yikes. Imagine being the tattoo artist responsible for Mike Tyson's face tattoos. Your artwork is seen all around the world, every time Mike Tyson gives an interview or appears in a movie. Now imagine you go to see Tyson's latest movie and you find your artwork plastered on the face of another actor, without your permission. This is the situation that S. Victor Whitmill, an award-winning tattoo artist, found himself in when he went to see Todd Phillips' The Hangover Part II. In the movie, Ed Helms awakes from another night of drunken debauchery to find his face covered in a tattoo very similar to Mike Tyson's, who plays an extensive role in the film. S. Victor Whitmill filed a lawsuit against Phillips and the production company that released The Hangover Part II. In the lawsuit, the tattoo artist makes the point that, while the art appears on Mike Tyson's face, the rights to the art are still owned by him and are not to be used without his express permission. In the lawsuit, Whitmill describes the tattoo as being "one of the most distinctive tattoos in the nation". Whitmill claims he was never approached about the use of his tattoo design. The lamp that makes up the "I" in the Pixar logo has become as essential and iconic a character as Woody, Buzz, Sully, or Nemo. The lamp is more than a piece of the logo, it's become the mascot for the company. Since the very first short, where the lamp made its debut, its appearance has become synonymous with the warm, family adventures that Pixar regularly brings to the screen. The funny thing is, Pixar didn't come up with it. The "Pixar" lamp is actually based off a real life lamp called the Luxo. For many years, Luxo was happy to have Pixar use its design. But that all changed in 2009. Pixar was releasing a special edition blu-ray of Up, and included with it was a little toy Luxo lamp. Apparently this was one step too far for the lighting manufacturers. They hit Pixar with a lawsuit. This is an interesting case, as the two companies never really made any secret about their sharing of a mascot. It wasn't until Pixar began packaging and selling essentially the same lamp and rebranding it as their own that Luxo got understandably upset. Eventually, the two companies reached a settlement. Disney agreed to not sell the Luxo Lamp toy, and Luxo allowed Pixar to continue using the design, as long as it was only in animation form. The two companies lived happily ever after! What do you think? Do some of these lawsuits hold water? Are they all nonsense? Sound off in the comments below!